Many children, these days, face problems that cause difficulty in breathing. We often tend to ignore them, but even mild breathing problems in children can become something serious if neglected. They may even cause long-term affects in your child. Be vigilant and take proper medical care immediately. According to the WHO (World Health Organization), nearly 2.6 million children are dying annually every year worldwide due to acute respiratory infections. It is time now for us to learn about the different respiratory problems faced by children. 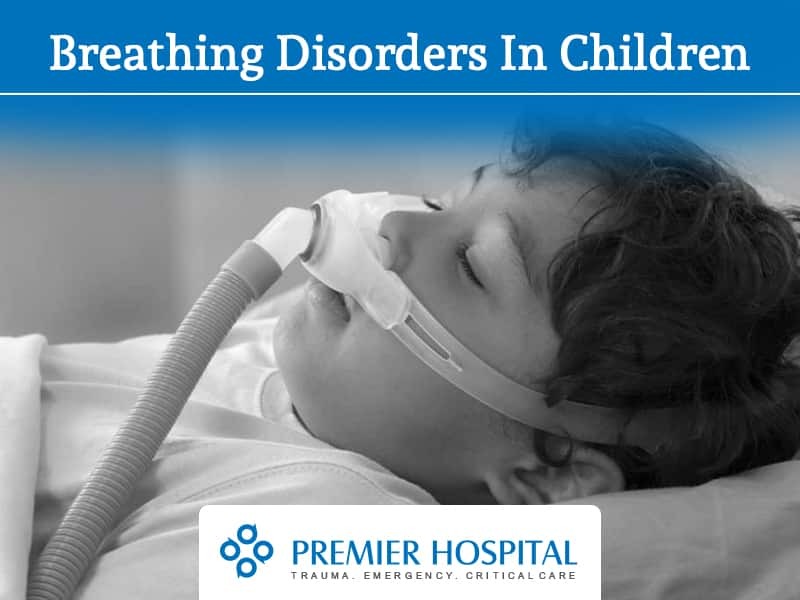 Breathing problems in children are medically termed as pediatric pulmonological problems. Pulmonology is a medical specialty that deals with diseases involving the lungs and respiratory tract. These respiratory disorders are classified into acute respiratory disorders and chronic respiratory disorders. Both, Acute (new-onset) and Chronic (long-term) respiratory disorders, can prevent the normal breathing function of your child. Acute respiratory infections are caused by microorganisms like Adenoviruses, Pneumococcus, Rhinoviruses, etc. Chronic respiratory disorders can be hereditary (like asthma) or due to other risk factors which include air pollution, industrial chemicals and dust, and frequent lower respiratory infections during childhood. Usually, It begins as a viral infection in the nose, trachea (windpipe), or lungs. If proper medication is not provided to the infection, it will spread to the entire respiratory system. If proper medication is not provided to the infection, it will spread to the entire respiratory system. Common Cold: It is also called Upper Respiratory Infection (URI). The common cold is a common illness in children and it happens when a virus inflames the lining of the nose and throat. Sinusitis: Sinusitis is an infection of the sinuses caused by virus or bacteria. These infections usually happen after a cold or with allergies. Bacteria begin to grow when the discharge blocks sinuses (Sinuses are hollow spaces behind the bones of the face, People have four pairs of sinuses which helps keep our head light) This leads to a sinus infection or sinusitis. Stridor: Stridor is a noisy sound with breathing. The noise is due to a partial blockage of the upper airway. It is caused due to the defects in the nose and throat, injuries to the jaw or neck, infections, etc. Influenza (flu): It is a contagious viral infection that affects the air passages of the lungs. This flu is caused by flu viruses and shows symptoms like high fever, body aches, cough, etc. Whooping cough (pertussis): It is a contagious disease and mainly affects babies and young children. It causes intense fits of coughing. The pertussis vaccine can help in preventing the illness. Acute Bronchitis: Bronchitis is an infection of the breathing tubes/passages (bronchi) in the lungs. Acute bronchitis is a viral infection. It can also be causes by bacteria or dust mites, allergens, strong fumes, or tobacco smoke. Bronchiolitis: It is an infection of the lungs often seen in winter and early spring. It leads to a swelling in the smaller airways (bronchioles) of the lung. This swelling blocks air in the airways causing breathing difficulty. Pneumonia: It is an infection of the lungs. Pneumonia is common in younger children, below 5 years. Most often pneumonia is caused by bacteria or viruses. It can also be due to fungal infections or tuberculosis if anyone’s immunity (ability to handle infections) is decreased. Chronic respiratory disorders are long-term disorders. If they are not treated properly with appropriate medication they can affect the whole life of the child. Asthma: Asthma is a chronic (long-term) lung disease which makes a child’s airways become sensitive. When the airways of the child is exposed to triggers, the airway makes more thick mucus than usual, the lining around the airways swell and muscles tighten. This makes the airways of your child become narrow and create difficulty for air to go in and out of the lungs. This disease is called asthma. Some of the risk factors which cause asthma are the environment, infections, chemicals, etc. Cystic fibrosis (CF): It is an inherited chronic disease of the glands that make mucus and sweat. CF affects the function of a cell protein called CFTR (cystic fibrosis transmembrane regulator). The inflow and outflow of water and certain salts of the body’s cells is controlled by CFTR. If this function of the cells is altered, mucus becomes thickened. The thickened mucus can affect many organs and body systems which includes sinuses, the reproductive tract and the respiratory system. So, let’s all pledge to not let our children face even a ‘mild’ respiratory problem, lest they lead to serious chronic health problems which affect our child’s life. Early diagnosis and treatment can cure your child’s respiratory problems easily. Book an Appointment right away and consult our expert Pediatric Pulmonologist at Premier Hospitals, if your child has any respiratory problem. Since the inception of Premier Hospital in 1991 till today, we have grown to unprecedented levels, due to our excellence in medical sciences and healthcare. Premier Hospital is the creation of Dr. Mahesh Marda and when it was first established, was only a small, 30-bed hospital facility. Back then, we provided only secondary care to patients, but that certainly has changed in the present landscape.